And I guess I didn’t really have a problem. 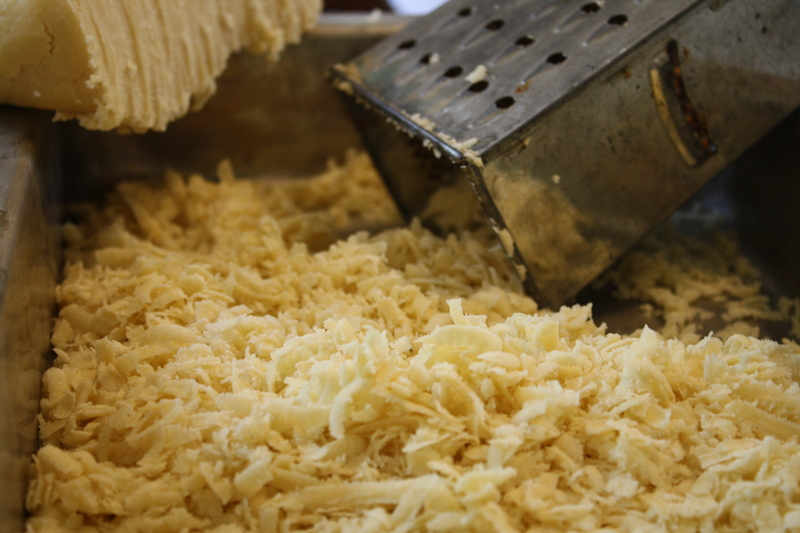 But if you’ve ever had to grate two giant balls of frozen dough while trying to figure out how to comfortably grip a metal box grater, then you know how I feel.Or maybe you don’t, because that’s not something you have to do everyday. Though, if you’re my mom, you get to use the shredder attachment on your Cuisinart food processor. Oh, to be a real adult with a real home and real kitchen equipment. Anyways, this shortbread recipe was fairly straightforward. You make the basic dough (with an ENTIRE box of butter, one pound, four sticks, goodness! ), then freeze it. “Then you grate it into a cake pan, spread it with a layer of homemade rhubarb jam (or store-bought preserves), and grate another layer of dough over it. There’s little that’s simpler,” the recipe states. I had really hoped to pick up spring rhubarb at our farmers’ market this weekend. Unfortunately, the man who sells rhubarb didn’t bring any to the market, saying it didn’t sell well the weekend before. 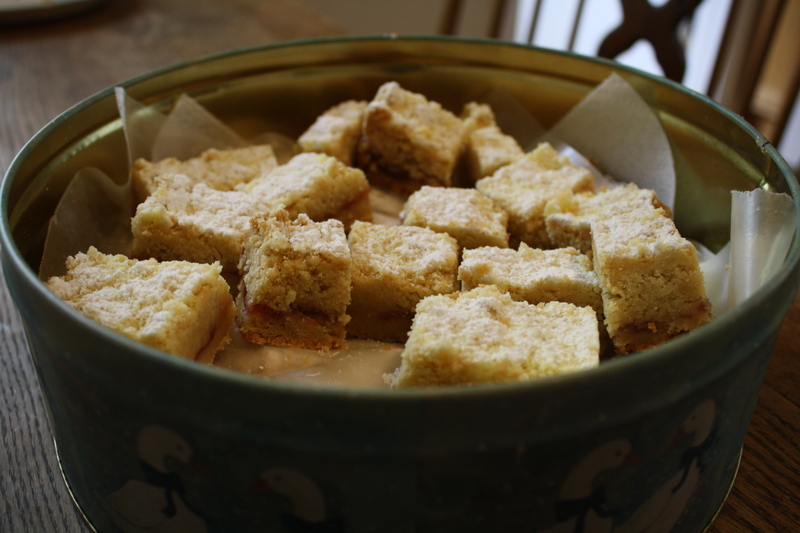 (And I could have bought an entire plant to ensure rhubarb for all my baked good needs, too!) But, he did sell jam, including a strawberry rhubarb jam. 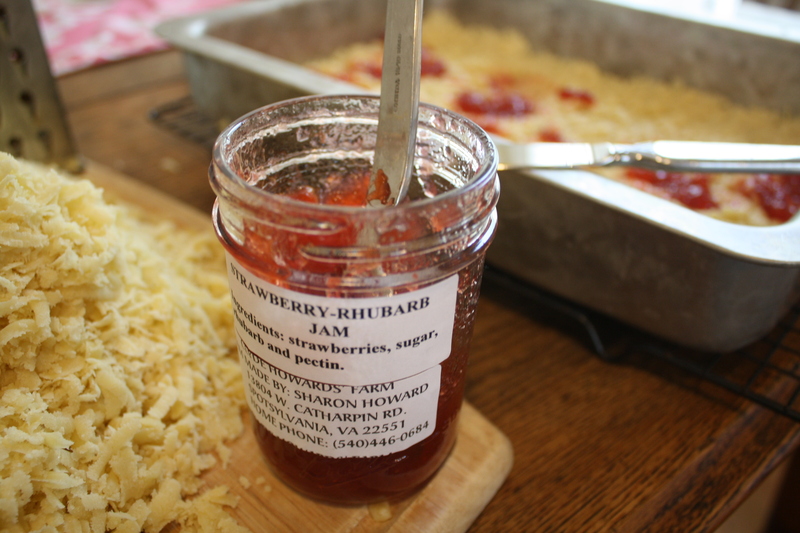 While it wasn’t quite as tart as I thought the plain rhubarb jam would be, I can’t turn down the strawberry-rhubarb combination, either. And it saved me a few steps, and another trip to the grocery store. Perfect. I grated one layer of dough, then baked it for 10 minutes, based on advice from my fellow bloggers. My mom and I couldn’t decide whether it’d be good to do this prebake or not, but I don’t think it hurt, at least. Though, it did make spreading the jam a little difficult, since the jam just wanted to mix with the warm gooey dough. 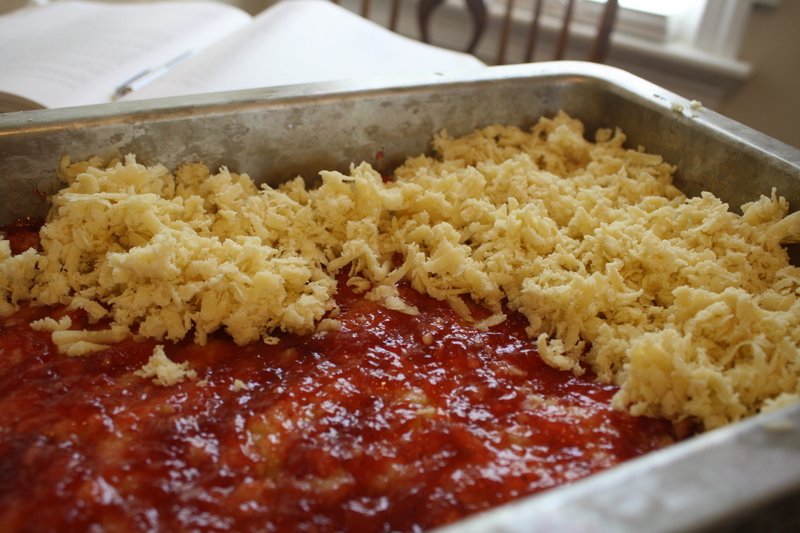 Then I topped the jam with another layer of grated dough. It looks like cheese, doesn’t it? Once they’re done baking, you cover the bars generously with powdered sugar. I covered my table pretty liberally, too. 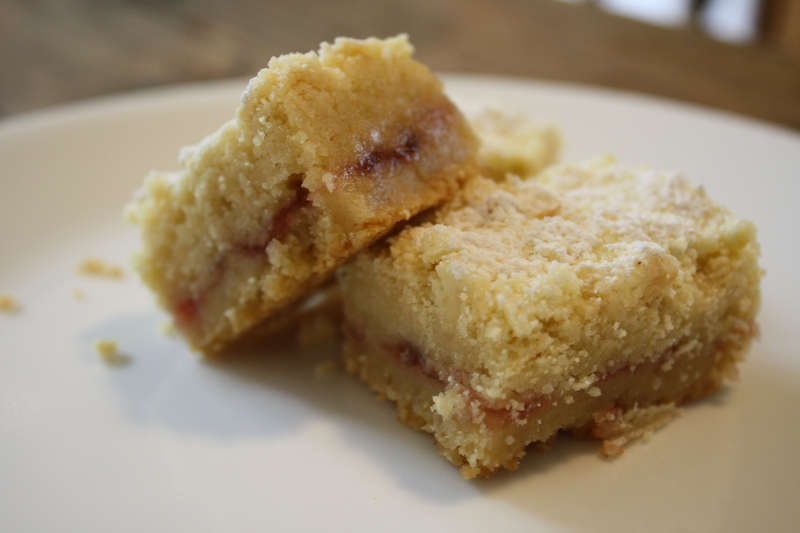 I did really like these shortbread bars, despite the hardship on my hands. They were different than a lot of cookies, rich but not overly so, like the rugelach was to some people. Next up are decadent looking pecan sticky buns with about six sticks of butter between the brioche dough and the buns. Also required is about 30 minutes in a stand mixer, along with two days of varied rising times. I’m not sure there’s any way these could possibly be ready for a morning breakfast. But I’ll have to go home to make these with my mom, since we can divide and conquer the steps. And take advantage of her grown-up fancy kitchen equipment. I see I’m not the only one who thought it looked like grated cheese. 🙂 It was a bit tough on the arms, but a good result! And with the jam, it looked like shortbread lasagna! Katie – people at work really liked them. I prebaked mine too but let it cool before spreading the jam so I didn’t have any trouble. I’d make these again! Can’t wait to try the sticky buns but I think we batter fast for a few days before hand! Great post! I am wondering about the next recipe too. The sticky buns look intense! Beautiful pictures & great looking cookies. Nice job – thanks for baking along this week. I was lucky. My nieces thought that grating the dough was the best part. These were wonderful, weren’t they? You’re lucky! I wish that I had some helpers! 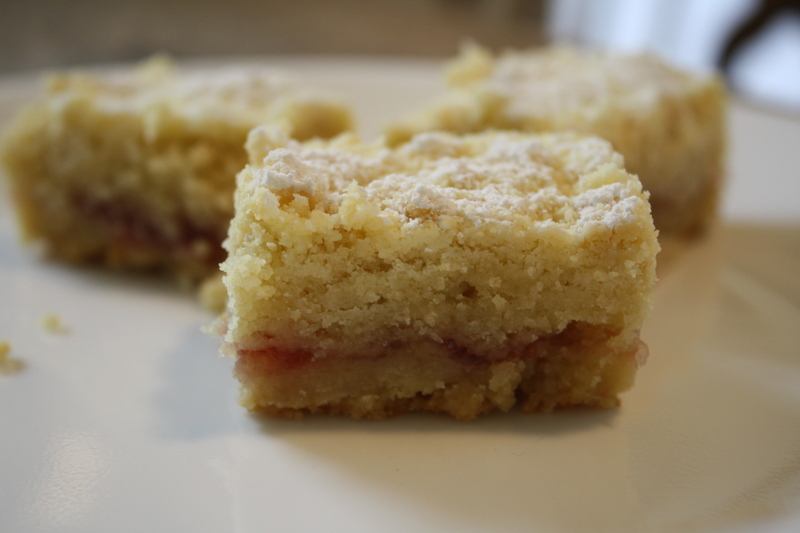 But my mom gave me a food processor for my birthday… so I think that I would make these again because that should make the grating step a breeze!